I upgraded to Panic’s Coda 2 when it came out, and never used it. Unless it was to trigger a software update. That was until last week. Last week I was working on an odd project to create a set of web pages that would be hosted on a payment processor’s site, but must look and feel like they are running on the actual site. This was for some non-profits to enable them to accept credit-card donations and electronic payment of member fees. Think of it as a customized set of Paypal pages that run on Paypal’s servers, yet are customized to the look and feel of the parent. Without Paypal, of course. Since our payment processor’s servers could only handle plain-old HTML and CSS files, this looked like a job for my trusty hammer tool, BBEdit. Which is what I started with. 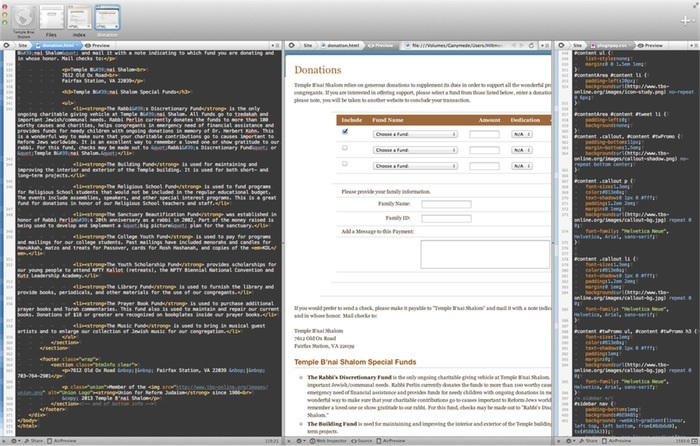 BBEdit’s handling of HTML and CSS is excellent. So, my plan was to mock up the pages as plain old HTML and use BBEdit’s live preview window to check that it looked right. I would then copy the final pages to a new BBEdit project where I could then insert the payment processor’s funky markup to make it work. And then iterate. As you do. But that led to a problem, one of navigation. I needed one BBEdit project window open for the mockup HTML (bottom left), another project window open for the processor’s templates (top left) and one preview window open for each page being mocked up. This is because BBEdit’s preview window is tied to the editor frame that is current when opening it, and it does not switch when you change to another editor frame containing a different file. I tiled the preview windows to help, but got confused as to which preview window to look at when I made a change to a HTML file. I tried just using one preview window, but that meant I had to close and open a preview each time I switched pages. This process was slowing me down. I think I wore out my ⌘-~ (switch window) key jumping around. The problem was that my muscle memory kept on making me hit ⌘-⇥ (switch app) when moving between mockup-pages and the templates even though they were in the same application. My brain was seeing these as two separate products. So, in personal OCD frustration, I decided to use another product for some of the work. And remembered I had Coda 2 which contains integrated previews. So I opened the mockups folder as a site in Coda 2 and used its split panes feature to add a preview window for each mockup, and then created a tab for each mockup page. And it worked brilliantly. I could focus on a single mockup page in Coda 2, see its changes live in the split-pane preview window, and jump tabs to work on different mockup pages with their own previews. Which suited my mindset. And then use ⌘-⇥ to jump back to BBEdit to modify the templates, which suited my muscle-memory. And which kept me sane. I then found out you could even add the CSS file as an additional pane in Coda 2, which made testing and customizing these mockup pages exceptionally easy and pleasurable. The result is that I got to create and test these mockups quickly and easily in Coda 2, run and post the marked-up templates from BBEdit, iterate as necessary, and got the job done on time without further frustration. 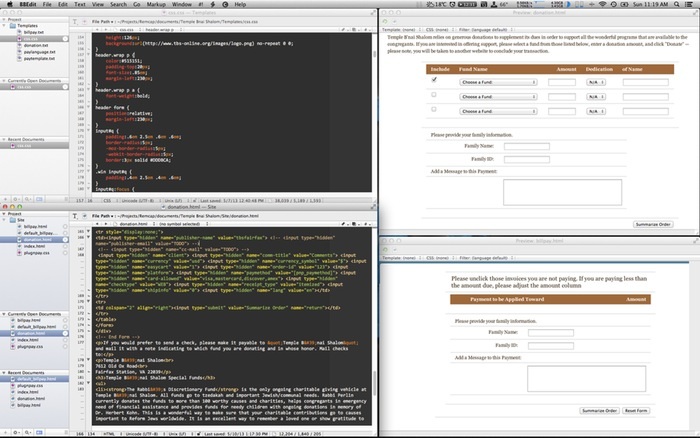 I don’t know of any other product that has live integrated pane previews for static HTML sites like Coda 2 does. Thank you, Panic, for this use case.